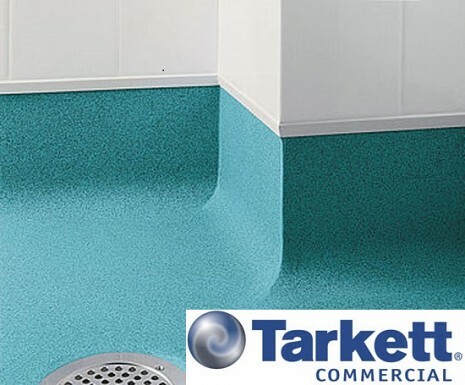 This is a 3 day course APPROVED by Tarkett, covering sub-floor preparation and installing commercial vinyl and safety flooring to various different areas including wet rooms, stairs and installing cap and cove correctly. This course is Tarkett approved. Creating a template for cove formed vinyl and Lino. Based in Solihull near Birmingham, FloorSkills is Europe’s largest independent commercial flooring training centre with over 8000 sq-ft of dedicated training area including 50 bays. We are approved by over 25 manufacturers in providing training of their products. Important notice: Please read carefully before buying training courses or accessing or downloading any training materials from this website. This is a legal agreement between you (Licensee or you) and Floorskills LTD of Unit 2 Lyndons Farm, Poolhead Lane, Earlswood, Solihull, B945ES (Licensor or we) for your purchase of Floorskills training courses and training materials (“Training Courses” and “Training Materials” respectively), which includes printed materials and online documentation (Documentation). By clicking on the “purchase” button on your event page, you agree to these terms which will bind you and (if you are an employer) your employees. If you do not agree to these terms, we shall not sell Training Materials or Documentation to you and you must discontinue the purchasing process now. Any combination of the above services, in a series of training modules specifically created for your own requirements. Please note that we reserve the right to change the course content of any Training Course at any time and without notice. the purchase of the Training Courses and Training Materials includes the granting of a non exclusive, non-transferable licence to use the Training Materials and the Documentation on the terms of such licence, which are set out in the following clause. Method of Delivery for Training Courses: once your registration for a Training Course has been successfully processed, you will receive an email confirming your booking, name of the course, course timing, and location of delivery. [IF YOU ARE AN ILT CUSTOMER] receive and possess the Training Materials associated with the relevant Training Course purchased and to use said Training Materials in conjunction with the attendance of said course, or the use of training information for the term of this licence provided that only the delegate of the relevant ILT Training Course may make such use of them. [IF YOU HAVE PURCHASED PACKAGED TRAINING SERVICES] enjoy all general rights that may be relevant to the specific training packaged for your needs, coupled with a licence to use the materials, the scope of which we have agreed with you when providing the packaged services. not to provide or otherwise make available the Training Materials or Documentation in whole or in part, in any form to any person without prior written consent from the Licensor. Delegates may transfer their registration for one course to another course up to 21 working days prior to the original course date. Once a delegate has transferred no refunds can be made for the cancellation of either course. Only one transfer by any delegate may be made. If you cancel a Training Course: – all cancellations must be made no later than 21 working days before the start of relevant Training Course. We will only accept cancellations that are made in writing. If a delegate fails to attend a Training Course, or a cancellation is sought within the 21 working days prior to the start of such course, full payment will be required. Refund Policy: if the refund is approved by the Licensor, it will be made through the original mode of payment only. No refunds shall be given for the cancellation of Distance Learning, Blended Learning and ELearning courses no matter when cancellation is notified to us. If we cancel a Training Course, or change course content: – we reserve the right to cancel a Training Course at any time, without incurring any additional liability to the Licensor or any delegate. In such circumstances, we will offer alternative dates, a full refund or a credit note. disclose know-how, and any other confidential information in Projects, only to those persons necessary for the purposes of the relevant Training Course and only to the extent necessary for the proper performance of their duties. 6.2 The Licensor shall procure that the obligations in clause 6.1 are observed by its employees, officers and agents. 6.3 The Licensor shall notify the Licensee immediately if it becomes aware of any disclosure in breach of the obligations in this clause 6. At the request of the Licensee, the Licensor will take all such steps as are necessary to prevent further disclosure. any information obtained without any obligation of confidence from a third party that is not in breach of this Clause 6. 6.5 The provisions of this clause 6 shall be deemed effective from the date first presentation of a Project was made to the Licensor and shall remain in full force and effect for 10 years from that date. You acknowledge that all intellectual property rights in the Training Materials and the Documentation anywhere in the world belong to the Licensor, that rights in the Training Materials and the Documentation are licensed (not sold) to you, and that you have no rights in, or to, the Training Materials or the Documentation other than the right to use them in accordance with the terms of this Licence. Nothing in this Licence shall exclude or in any way limit the Licensor’s liability for fraud, or for death or personal injury caused by its negligence, or any other liability to the extent that it may not be excluded or limited as a matter of law. except for matters caused by the Licensor’s negligence or wilful default (or that of its employees and agents), the Licensor shall not be liable to you for any loss, harm or damage caused to any candidate, candidate’s property or your premises for any courses conducted by the Licensor on your premises. You agree to indemnify and hold harmless the Licensor against all cost or losses suffered or incurred by the Licensor due to claims, demands, suits, proceedings, actions, losses, judgments, damages, costs (including all reasonable legal fees), expenses, fines or penalties or actions against the Licensor arising out of or relating to a third party’s any alleged harm, loss or damage caused to a candidate’s person, property, or to your premises on which the course relevant to such candidate takes place, due to any cause other than the Licensor’s negligence or wilful default (or that of its employees and agents). Subject to what is provided above, the Licensor’s maximum aggregate liability under or in connection with this Licence, or any collateral contract, whether in contract, tort (including negligence) or otherwise, shall be limited to a sum equal to £500. The Licensor’s liability for infringement of third-party intellectual property rights shall be limited to breaches of rights subsisting in the UK. These terms set out the full extent of the Licensor’s obligations and liabilities in respect of the supply of the Training Courses, Training Materials and Documentation. There are no conditions, warranties, representations or other terms, express or implied, that are binding on the Licensor except as specifically stated in this Licence. Payment can only be made using an authorised credit card at the time of the transaction on our website, Receipts for payment are provided in electronic format. Payments and bookings can be made over the phone and able to pay by Card, Bacs or Cheque. We take reasonable measures to ensure that our website is a secure site. Please see the terms and conditions of use on our website concerning access to it and use of the facilities on it. We take all necessary steps to ensure that any information provided by you for the purposes of payment will be kept secure. Invoices payment terms are 30 days from date of invoice or at least 7 working days before the start of the course, whichever is sooner. A deposit is required to reserve your booking. If any information that you have given to us proves to be incorrect, which has resulted in our not charging you the correct fee for the courses that you are buying, we reserve the right to adjust the fee (upwards or downwards) so that it is the correct fee for your circumstances. the Licensee (where it is a company) becomes insolvent or unable to pay its debts (within the meaning of section 123 of the Insolvency Act 1986), enters into liquidation, whether voluntary or compulsory (other than for reasons of bona fide amalgamation or reconstruction), passes a resolution for its winding-up, has a receiver or administrator manager, trustee, liquidator or similar officer appointed over the whole or any part of its assets, makes any composition or arrangement with its creditors or takes or suffers any similar action in consequence of its debt, unable to pay your debts (within the meaning of section 123 of the Insolvency Act 1986). you must immediately delete or remove the Training Materials or Documentation from all computer equipment in your possession, and immediately destroy or return to the Licensor (at the Licensor’s option) all copies of the Training Materials and Documentation then in your possession, custody or control and, in the case of destruction, certify to the Licensor that you have done so. This Licence is binding on you and us, and on our respective successors. You may not transfer, assign, charge or otherwise dispose of this Licence, or any of your rights or obligations arising under it, without our prior written consent. We may transfer, assign, charge, sub-contract or otherwise dispose of this Licence, or any of our rights or obligations arising under it, at any time during the term of the Licence. If we fail, at any time during the term of this Licence, to insist upon strict performance of any of your obligations, or if we fail to exercise any of the rights or remedies to which we are entitled, this shall not constitute a waiver of such rights or remedies and shall not relieve you from compliance with such obligations. No waiver by us of any of these terms and conditions shall be effective unless it is expressly stated to be a waiver and is communicated to you in writing. Any notice required or permitted to be given by either party to the other under these terms shall be in writing. If any provision of these terms is held by any competent authority to be invalid or unenforceable in whole or in part the validity of the other provisions of these terms and the remainder of the provision in question shall not be affected thereby. The provisions of Regulation 13(1) of The Consumer Protection (Distance Selling) Regulations 2000 (“the Regulations”) shall apply where the purchase to which these Conditions apply is made by a Buyer who is a consumer (being someone purchasing Publications outside the course of a business) who will therefore not be able to cancel this Contract under Regulation 10 of the Regulations once the Buyer has with the consent of the Seller commenced performing the Contract by starting to download a Publication. These terms and any document expressly referred to in them represent the entire agreement between us in relation to the purchase of Training Courses, Training Materials and Documentation and supersede any prior agreement, understanding or arrangement between us, whether oral or in writing. We each acknowledge that, in entering into these terms, neither of us has relied on any representation, undertaking or promise given by the other or be implied from anything said or written in negotiations between us prior to entering into these terms, except as expressly stated in these terms and conditions. Neither of us shall have any remedy in respect of any untrue statement made by the other, whether orally or in writing, prior to the date of entering into these terms (unless such untrue statement was made fraudulently) and the other party’s only remedy shall be for breach of contract as provided in these terms and conditions. We have the right to revise and amend these terms and conditions from time to time. Have you used FloorSkills training services before? You may be eligable for discount on this course. alternatively, send us a message. Europe’s largest multiple award winning training centre. Call us on 01564 703900 or catch up with us on social media.